Have a question on MT-07? MT-07 is available in 3 different colors - White, Blue and Grey. When the shifting phase of naked roadster revival by Yamaha from FZ series to MT series globally happened, the MT-07 was one of the very first models to appear out as an initial result. With the MT-07, Yamaha previewed its all-new approach in making the naked roadsters. The currently available Yamaha MT-07 is being offered in two color options – Blue and White. The MT-07 comes with a petite and very simply styled headlamp at the front, which misses the wickedness of that of the higher positioned MT-09. It also misses out on LED inserts, thus making the overall front fascia look a bit dated in appeal. However, what adds some sportiness to the frontal view is the placement of the single piece handlebar, which is positioned quite at a height, just like in a supermoto. Unlike the other modern designed MT series of roadsters from Yamaha, the MT-07’s fuel tank is not too sharp-edged in terms of design – it possesses some bulk which adds some muscularity to the motorcycle. The fuel tank comes with contrasting tank extensions, which do house the Yamaha logo and air scoops at their front edges. With negligible side body panels, the MT-07 looks minimalist but aggressive. However, the MT-07 comes with a proper tailpiece with a lifted up tail section, just like in many supersport motorcycles. Again, unlike other MT series of motorcycles, the MT-07 comes with a short rear fender and conventional positioning for its LED tail light. At the center of the flat handlebar is placed a fully digital instrument console, which displays digital readouts for speedometer, tachometer, fuel gauge, temperature gauge, and gear indicator. The ignition keyhole is placed above the instrument console, which is a very unique trait to this motorcycle. Apart from showing its excellence in power delivery and refinement in the engine department, another aspect where the MT-07 proves to be a typical Yamaha motorcycle is when it comes to riding dynamics. The MT-07 has been equipped with upside-down telescopic hydraulic forks at the front and a fully adjustable hydraulic monoshock at the rear. In the traditional Yamaha manner, the MT-07 impresses with its spot on handle geometry, and thanks to its leaner stance, it offers a great balance of precise handling and ride quality. In the braking department, the MT-07 is blessed with dual 282mm discs at the front and a single 245mm disc at the rear. As with the current norms in the middleweight naked motorcycle category, the MT-07 has been fitted with an inline twin cylinder, liquid-cooled, fuel-injected, 689cc engine, which is larger in size than the segment’s erstwhile norm of a sub-600cc engine. Coupled with a 6-speed constant mesh gearbox, this engine produces a maximum power output of 74.8 PS and a peak torque output of 68 Nm. The engine shares its crossplane layout for its crankshaft from the flagship MT-10, which has allowed Yamaha to give it a crank angle of 270 degrees. While the MT-07 misses out on many sophisticated electronics like Traction Control and ride modes, which have become a norm in this segment, it packs in a dual channel ABS as standard. As said before, the MT-07 was one of the first new generation MT naked roadsters from Yamaha, which does offer a great blend of practicality, ease of riding and excellent performance in one single package. Sure, the design now needs a slight makeover to make it in line with other MT series of motorcycles. And in terms of features too, it lags behind its competitors. However, the core attributes like overall performance from its engine and the amazing riding dynamics make up for a great big bike experience. 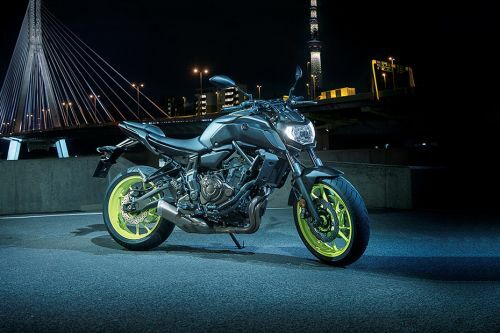 What are the Safety Features Available in Yamaha MT-07? Is Yamaha MT-07 available in Electric?